I'm really enjoying painting cats!. After 20 years of dogs, who'dve thought? 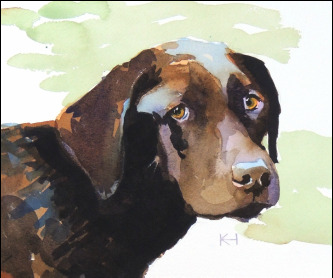 Pets and fine portraits and wh﻿﻿﻿en we want to celebrate the love of our pets, we wan﻿﻿﻿t a painting that captures the joy and spirit of our loved one rather than a generic breed painting that might resemble her/him. I have worked long and hard to develop the ability to capture your pet. I hold a Master of Fine Arts degree in painting and I studied portrait painting for two years at Chicago's historic Palette and Chisel atelier. 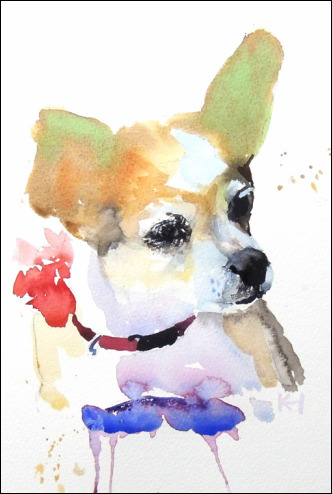 I started doing sketches and oils of my Beagle, Elvis, over twenty years ago. Since then I have painted and drawn over six hundred portraits for folks around the world just like you; people who really love and want to celebrate their loved ones. How do we do this? You simply provide me a good photo of your dog or cat and I take it from there. I do an original, one-of-a-kind watercolor painting using the photo as reference. You pay nothing until I've done the painting to your delight. Simply e-mail a photo (I prefer if you send me several) of your loved one. If you need tips for taking the best photo from my point of view as the artist, click here. I'll create the portrait and send you a photo for your approval. Upon your approval and payment, I ship the portrait. The portrait comes mounted on board and matted to fit any 11" x 14" frame. The cost is $120 and can be paid right here on the site or with PayPal. So click here or below. I can't wait to see my next subject! !